Lets start with sockeye fishing as this seems to be the hot topic. There were some pretty hot days earlier in the week from the Bell all the way past the North Arm and Iona Jetty and all the way down to Sandheads. So yes, everywhere, but it definitely slowed down these past few days. There were some schools around the last 48 hours but you had to land right on them early in the day and get that first few hours of action or you had a tough day. Don’t despair, this is just the tip of the iceberg as they say, and millions more are on the way (literally). Sockeye fishing is going to continue to get better on a daily basis going forward. Captain Eddies guest with just a few of the sockeye from a great day on the water. Also in last weeks report I commented on when I thought chinook fishing would pick and sure enough it was good yesterday. I said 2-3 days after the full moon on Saturday, so I was off by a day. It was good on Wednesday and a friend of mine had 7 to the boat yesterday and I heard of some decent reports from others these past few days. 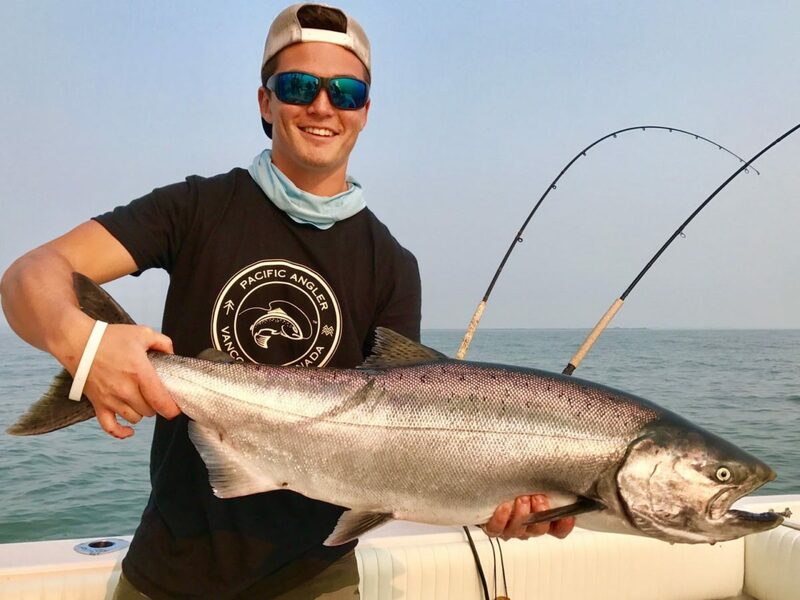 I am not going to get into the specifics of where they were fishing as the Vancouver Chinook Classic is this weekend and these guys are all in the event so no locations will be revealed. So as per usual, things are picking up just in time for the tournament and it should be a productive weekend. Chrome and UV flashers have been productive on the higher up rods. The Gibbs and Oki flashers in Betsy and Green Onion finishes have been hot when paired with UV Green and Chrome Green/Chartreuse Rhys Davis teaser heads with 5.5 to 6.0 anchovies and a 6 foot leader. On the lower rods the glow flashers have been good. The Gibbs Phantom in chartreuse has been very productive, as has the Madi, BC, and STS and of course the Oki Salty Dawg. These flashers paired up with Rhys Davis teaser heads in Glow Green/Chartreuse, Bloody Nose, and Glow Blue/Green with 5.5 to 6.0 anchovies and a 6 foot leader, have been very productive. Productive depths have been 30-75 on the riggers. It does seem there have been a few larger fish around as well, so be ready for that. I will be running the fishing portion of the Vancouver Chinook Classic once again this year as Derby Master, so I am looking forward to zipping around on the RIBs this weekend and seeing some nice chinook. So if you see me ripping by in a blacked out 34 footer at high speeds you will know its me and my crew.